Toshiba will join the tablet race later this year with an Android-powered computer based on an Nvidia Tegra processor, it said Tuesday. The device, which doesn’t yet have a name, was one of several shown Tuesday in Las Vegas on the eve of the Consumer Electronics Show. 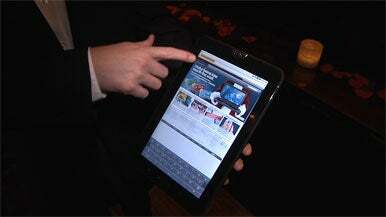 A prototype Android-based tablet PC from Toshiba was unveiled at the Consumer Electronics Show in Las Vegas. The demo device is running Android 2.2, but Toshiba hopes to have Android 3.0 in the launch model. The new version of Google’s operating system, codenamed Honeycomb, has better support for tablets than current versions. Toshiba’s time-frame matches that of Asus, which earlier at the show said its Honeycomb-based tablet would be available in May. The tablet includes Toshiba’s Resolution Plus, which enhances standard-definition video to give it the appearance of high-def. Until now the system has run on a custom chip, Toshiba’s SpursEngine processor, but in the tablet it makes use of the Nvidia Tegra processor. The computer will have a 10-inch screen with 1280 x 800 pixel resolution, and two webcams. The front-facing camera is 2-megapixels and the rear-facing camera is 5-megapixels. It has connectors for USB, Mini USB, HDMI and an SD Card slot. Toshiba also showed off a new version of its Qosmio multimedia laptop with built-in 3D display. The display doesn’t require 3D glasses. It has dual cameras that track the user’s eyes and help the laptop deliver a picture with the illusion of depth. Like no-glasses 3D TVs shown previously by the company in Japan, the technology relies on a custom-developed screen made by Toshiba, but it isn’t perfect. While the center of the image was clear and appeared to have depth, the edges of the image were blurred.